The Double Scoop - this 29 km route follows bicycle paths and bike-friendly roads from Hamilton's Bayfront Park to Burlington's Spencer Smith Park and back. Click here to see the route. 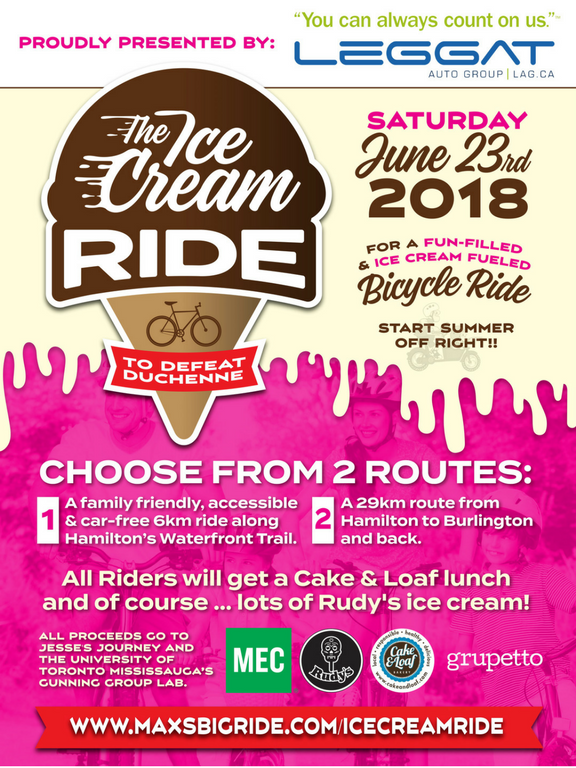 You won't ride away hungry as we'll treat all riders with refreshing frozen paletas from Rudy's at the halfway point, a tasty lunch catered by Hamilton’s amazing 'from scratch' neighbourhood bakery, Cake and Loaf - plus simply delicious ice cream from Rudy's at the finish line! From Hamilton's Bayfront Park to Spencer Smith Park in Burlington and back. Ice cream + lunch included. From Hamilton's Bayfront Park to Spencer Smith Park in Burlington and back. Ice cream and lunch included. A family friendly, accessible and car-free 6 km route along Hamilton's Waterfront Trail from Bayfront Park to Princess Point and back. Ice cream + lunch included.